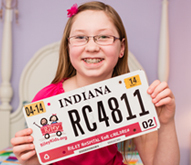 Learn how you can support Riley through some of your favorite businesses. We invite you to explore ways to partner with us in valuable and meaningful ways for your employees, your customers and your brand. Together, we can make a difference in the care and treatment of Indiana’s children. Employee giving programs can be structured in a variety of ways, including payroll deduction, annual drives and matching programs. Through sponsorship, we can create a value exchange that drives awareness for your brand and brings support to our Riley kids and their families. Please contact us to learn about upcoming events and campaigns. To learn more about corporate giving or to take a tour of Riley Hospital for Children, please feel free to contact Gillian Gray at ggray@rileykids.org or 317.759.6923.